OAFE - Points of Articulation: Whywolf? Going through some boxes, I came across a weird old werewolf toy whose origins I couldn't remember. I wasn't surprised to find this toy: after all, I've gone on (and on and on) at length in various reviews about my love of werewolves, so me having it was no real stretch. I've slowly doled out my nigh-encyclopedic knowledge of the world of lyncanthrophy, but I still can't say why I like them so much more than other classic monsters. When it comes to "classic," nobody beats the werewolves. Vampires? Mummies? Frankenstein? They're all relative newbies compared to the lycans. Animal cults have been connected to altars from 75000 BC. Turkish cave paintings from 8000 years ago depict leopard men. Were-creatures show up in the Epic of Gilgamesh, the Odyssey and the records of the ancient Olympics. Half the Egyptian pantheon are humans with animal heads. Werewolves are primal creatures, almost as old as society itself, but they still get the love today. The pop-culture werewolves we think of now have a much newer pedigree, but we'll get to that in a bit. Classic loups-garous, which started showing up in the legends of ancient Greece, were either the children of beasts or transformed by magic: Plato, Pliny the Elder and Virgil all mentioned the creatures, and the term "lycanthropy" comes from Apollo Lycaeus (if you want to go way back, some scholars posit that Apollo was a Grecian adaptation of Up-Uat, a very old name for Anubis, the jackal-headed Egyptian). Werewolves migrated across the globe along with Greco-Roman culture. In the fifth century, St. Patrick was sent to Ireland, where he converted the king of Wales to a werewolf. a man, and wolf - thus, a man in the semblance of a wolf. 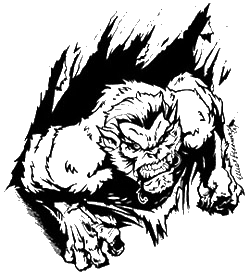 "Gar" of garou is wer or war, a man; and "ou," a corruption of orc, an ogre. "Loup" comes from the Latin "lupus" by way of Old French. Deals with the devil were a common theme in the Middle Ages, as you might expect. Superstitious, uneducated yokels are always turning to wacky religious theories when things get too complex for them. But that's literature, and as we all know, literature seldom has much to do with popular culture. What werewolves really needed to break into the big leagues of hysteria was a good bit of gossip. That's what werewolves were for centuries: humans who could turn completely into wolves at will. Heck, even the tale of Little Red Riding Hood can be read as a form of lycanthropy. It wasn't until the 1940's that the stuff about bites, full moons and silver came into play, thanks to a guy named Curt Siodmak. 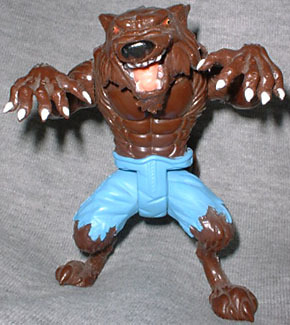 My recently found werewolf toy obviously follows the modern tradition: he's wearing a pair of shredded bluejeans. The sculpt pegged him as an older figure, and the only clue was the 1993 copyright and the letters T F T C on his belt. A bit of research revealed that he was based on the surprisingly innappropriate Tales from the Cryptkeeper cartoon. If the original EC Tales from the Crypt comics led to Seduction of the Innocent, then Frederick Wertham must have been rolling over in his grave at the prospect of a kids' cartoon and a line of toys based on the books. 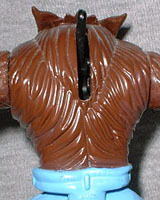 The figure really only moves at the shoulders and hips - his head is connected to a lever on his back. Push the lever a little bit down, and he raises his head as if howling. Push it all the way down, and the head snaps forward in an attack. It's actually a pretty clever two-stage action feature, but it's a shame that he cant't turn his head at all. His tail plugs into the figure by use of a square peg, which allows you to choose one of four "poses" for it. The sculpt is simple by today's standards, but was pretty good for a minor line in 1993. The unnamed werewolf has a decent pose and actually balances well, despite his decidedly lupine feet. He's got his arms raised in a cartoony sort of threatening motion, or maybe he's just a holdover from the "Thriller" video. The little guy stands 4¼" tall. I'm a big lycanthrope fan, and I have almost every werewolf toy I've ever come across. Some are good, some aren't, but that doesn't matter. This Crypt werewolf will feel the love simply by being part of a long and honored tradition. So, werewolf? Over there wolf. Whywolf? Why not wolf?